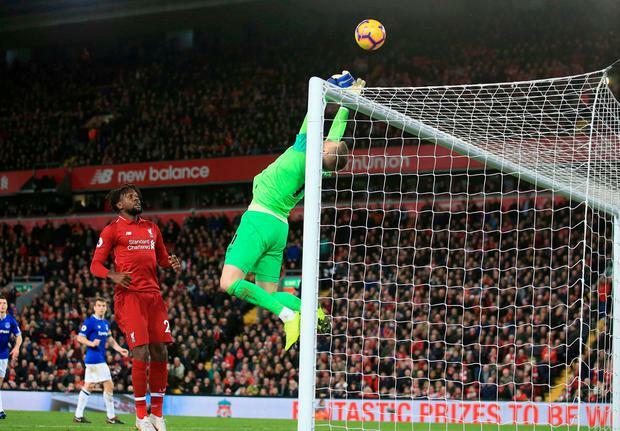 Just as it seemed the winners of the 232nd Merseyside derby would be Manchester City, Jordan Pickford handed victory to Liverpool. Quite literally. 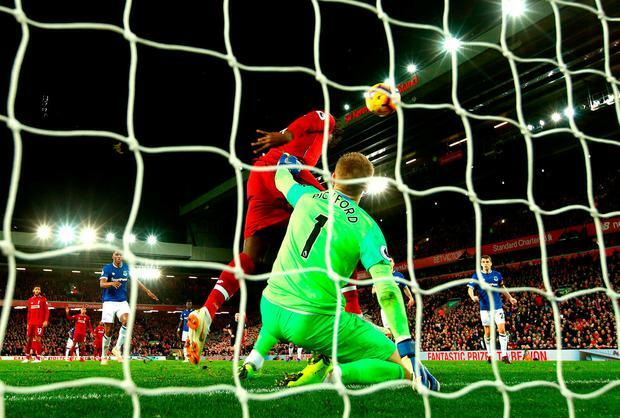 The Everton goalkeeper was guilty of the most appalling error as he allowed Divock Origi to head home from point-blank range to claim the only goal. In the 96th minute. The identity of Liverpool's scorer was also significant and resonant given the horrible, season-ending injury Origi suffered in this fixture more than two years ago. It has been a long, long way back for the 23-year-old - this was his first appearance in the Premier League for Liverpool since August 2017 and his first goal since three months earlier. 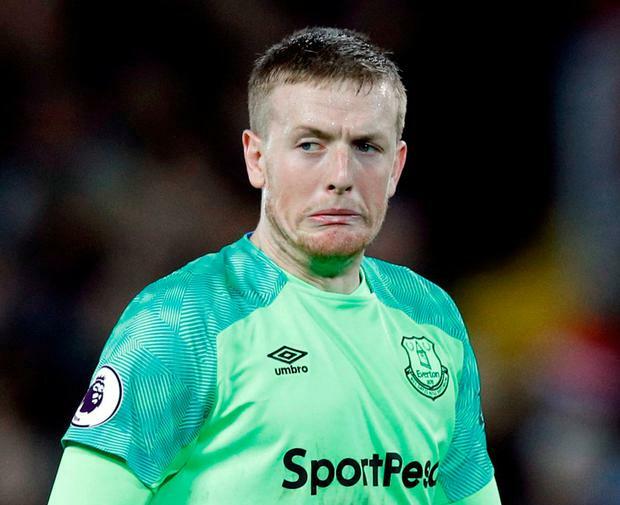 The Belgian will never score a weirder, more freakish one while, unfortunately, Pickford will be reminded of it for a long, long time. The England goalkeeper had a very strange, nervy afternoon, the tone being set early on as he shanked two clearances. But they were nothing compared to what later happened. The result left Everton stunned, Liverpool delirious and, for the neutral, the title race that bit more open. Instead of extending their lead at the top to four points, City saw it reduced to two ahead of the midweek round of fixtures. For Everton, there was that hurt when it felt they would leave this fixture feeling like they had performed as well as they had done since last winning at Anfield in 1999. Origi has become a man forgotten amid the torrent of attacking forces that have overtaken him at Liverpool but Klopp eventually called on him here. This was not an afternoon for Mohamed Salah, or Roberto Firmino, nor for Sadio Mane, who was irrepressible but missed a host of chances. Origi also missed one, hooking the ball against the crossbar from a couple of yards out as he latched on to a Virgil van Dijk header. He should have scored then but it was from the same combination, if in far more unlikely circumstances, that he did. It was clear how odd it was by Van Dijk's reaction. The defender had met Yerry Mina's clearing header from one, final set-piece delivery but volleyed wildly up into the air. The Liverpool captain turned his back on his own effort in disgust with the ball looping up. Pickford watched it drop but was clearly concerned as to where the ball was going with its backspin and finger-tipped it from above the crossbar. It bounced on to the bar again, then fell for Origi who headed into the unguarded net from barely a yard out. "It was a freak one, really," Pickford said. "The ball spun and, as I tried to flick it over, my hand hit the bar. "It's unfortunate but I am strong mentally and I will get over it... I think it's the Everton luck when it comes to Anfield. There is always a case as a goalkeeper... if you make an error, it will lead to a goal. Unfortunately, it has been me today." Chaos broke out. Pickford protested, without having anything to protest about, and then rubbed the back of his head as he realised the enormity of his blunder. Klopp tore on to the pitch, manically running half its width to celebrate with goalkeeper Alisson - and later apologised for his response - while Everton were left utterly stunned. At the final whistle, Alisson hugged Pickford in sympathy. Klopp spoke of the intensity and, although his team were far from at their best, they deserve significant credit for the way they kept going, especially after their midweek exertions, and disappointment, in the Champions League away to Paris St-Germain. But it was cruel on Everton who have failed to win any of their past 18 games against Liverpool and on their manager Marco Silva who, again, demonstrated the positivity he has brought to the club and who, in Andre Gomes, had the game's outstanding midfielder. They are a team transformed. Gomes had come closest for Everton, in fact, in a remarkable incident that he had initiated. The on-loan Barcelona playmaker, who Everton would love to sign permanently, surged forward to find Bernard whose cross was met by Theo Walcott with a clever cushioned header back across goal. Gomes dived in to head goalwards with the ball came off Alisson's chest as the Brazilian covered brilliantly. Even then the rebound hit the prone Gomes and trickled goalwards with Joe Gomez sprinting back to hook it off the line - before Gylfi Sigurdsson could only force it against a post. But that was not the miss highlighted by Silva, who pointed to a Mina header in the opening minutes from a Sigurdsson free-kick which he sent wastefully wide. Liverpool will have felt the same about two first-half chances. First, Mane fired over when put clear by Salah with a dink over the top, then Xherdan Shaqiri - with Salah again the provider - took one touch too many and allowed Pickford to divert his shot away.